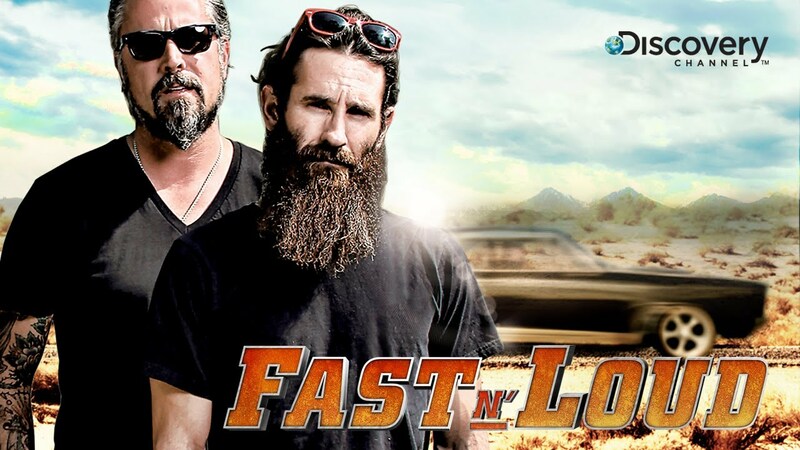 on Two of Discovery Channel‘s biggest hit TV showsFast N’ Loud and Diesel Brothers starting this season! 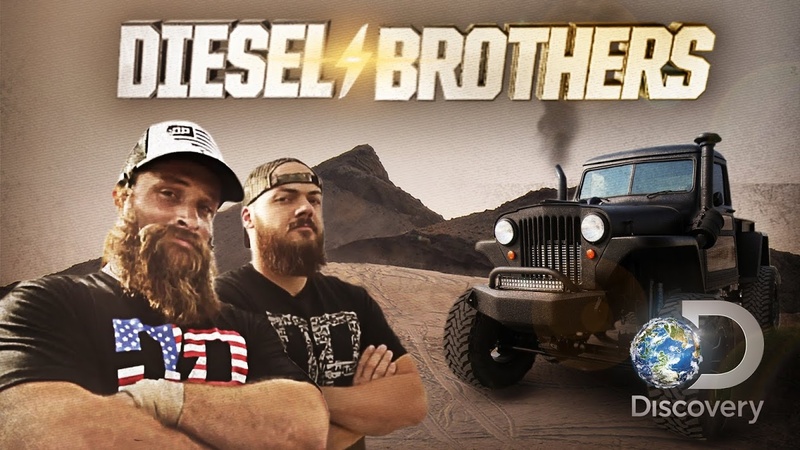 ACE Automotive Cleaning Equipment is excited to announce that our ACE soda blasting and abrasive blasting cabinets will be seen on two of Discovery Channel‘s biggest hit TV shows… Fast N’ Loud & Diesel Brothers starting this season! ACE teamed up with Armex and Safety-Kleen to make these projects a reality. 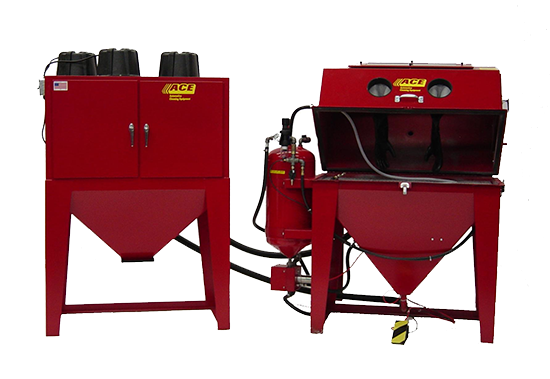 ACE Sandblasting offers an economical line of soda blasting equipment, designed to meet numerous cleaning applications. All of our products use environmentally friendly soda blast media. 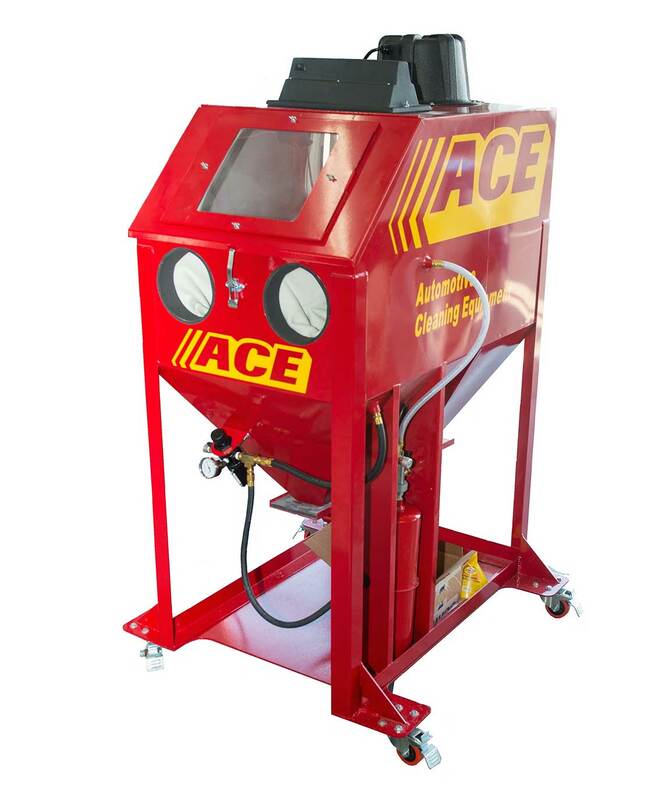 Each of ACE's soda blasting models is designed to provide a cost effective way to take advantage of soda blasting's unique cleaning properties. Remove paint, oil, mold, carbon, grease, grime, and many other difficult to remove soils and paints, without damaging the underlying material. I just wanted to tell you how pleased I am with your ACE Model 2-PS Heavy Duty Portable soda blaster. I normally figure that something I buy will give me about 50% of what is claimed for it. Your soda blaster performs exactly as you said it would. I'm as happy as I can be with it. Thanks! Hurricane Katrina left a lot of mold damage here in New Orleans. We used to sand the mold off, but it just took too long. Thanks to the Model 2-PS, our crews can knock out jobs a lot faster, and I can price my work more competively. I don't know how we would have kept up without your equipment. I just received my Model 2-PS. I wanted to try it out, so I blasted the paint off a fender here at the shop. I couldn't believe how quick it was, and the surface of the metal is just like new, a lot different than sandblasting. I think I'm going to like this. We are very happy with the soda blast cabinet. We can clean these aluminum cylinder heads and never have to worry about leaving part of a glass bead somewhere in a thread hole or oil passage. The Performance Plus is the perfect tool for my furniture refinishing hobby. Thanks ACE! Call Gene "The Soda Blasting Guy" at 616-392-9090 or 616-402-4120 to find out more about our soda blasters, or to place an order. If you would like to contact us by email, click here. This model has heavy duty ASME construction and is still low in price. Adjustable pressure regulator allows operator to blast at low pressure for sensitive jobs or at high pressure for tough applications. The ACE Model 2-PS will remove paint, mold, grease, carbon, oil, grime and more. It is wheel mounted and ready for instant hook-up to your air supply. This unit is ready to take on those tough cleaning jobs. Strip cars and boats, do mold and fire damage remediation, remove graffiti, clean masonry, clean transmission casings, and much more. ACE SODA PLUS Soda Blast Cabinet with built-in Dust Collector! The ACE SODA PLUS can be yours for only $2,499!! The ACE SODA PLUS combines a 24” wide x 24” deep x 23” high (working area) soda blast cabinet with a built in 100 cfm HEPA cartridge dust collector. The overall dimensions of the ACE SODA PLUS are 28” wide x 54” deep x 65.5” high. 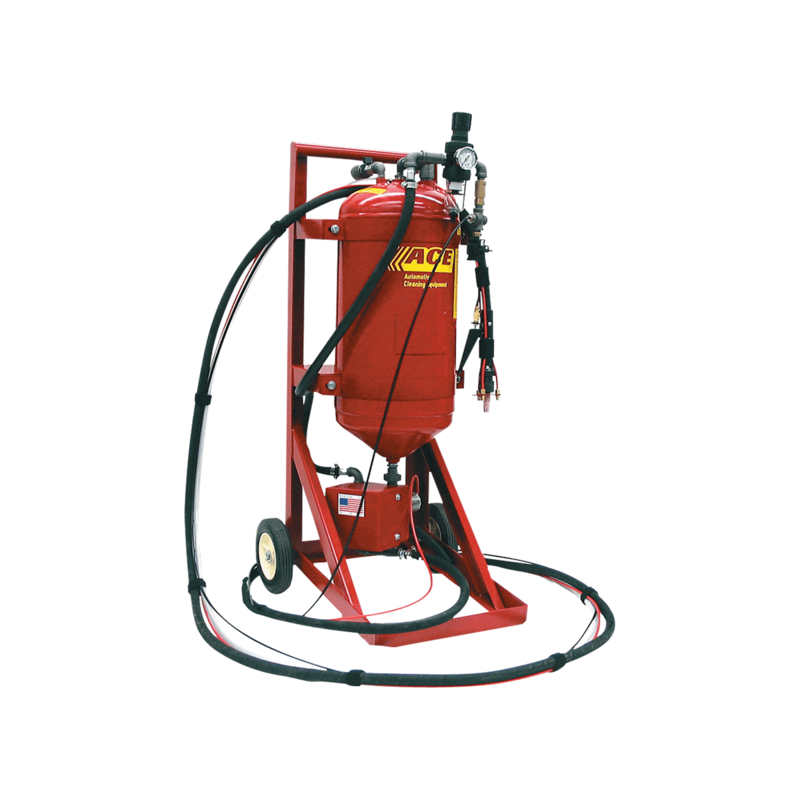 This compact size makes the ACE SODA PLUS the ideal soda blasting solution for small workshops, garages or factories where floor space is a consideration. 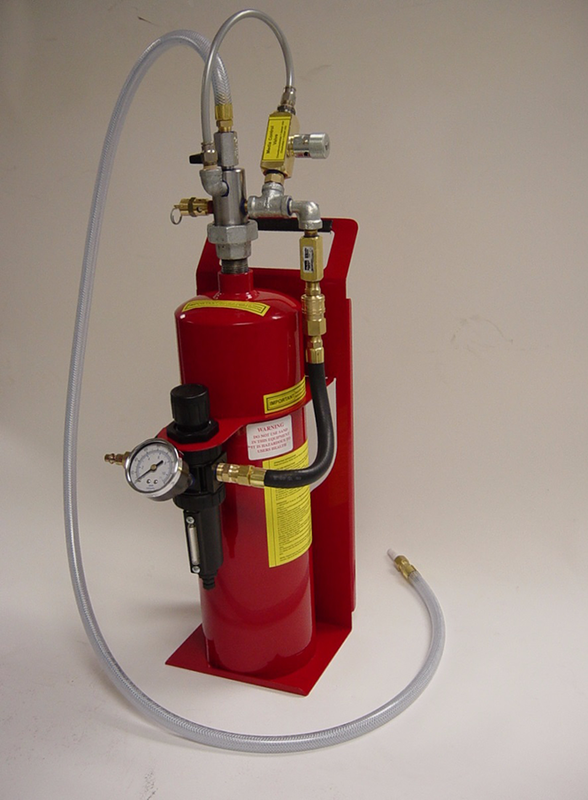 The ACE SODA PLUS requires a minimum air supply of only 7 cfm at 100 psi to operate! Like all of our equipment, the ACE SODA PLUS is made of 11 and 14 gauge steel featuring all welded construction and a durable powder coated finish. The ACE SODA PLUS is equipped with an adjustable pressure regulator and media control valve for fine tuning your soda blasting to the particular job at hand. The 10 lbs capacity media tank allows 15-30 minutes of continuous soda blasting. Refilling the tank is quick and simple. A heavy duty work deck, generous arm hole openings and fluorescent lighting make the ACE SODA PLUS a comfortable work experience with superb visibility for the operator, thanks to the built in 100 cfm HEPA filter dust collector. A spring loaded trap door on the bottom of the dust collector makes removal of the waste a breeze. Optional features include lockable wheels on each leg for easy movement within your work area and a nozzle kit with 6 nozzles (4 different sizes) allowing you to tailor your soda blasting to your air compressors output. Best of all, the ACE SODA PLUS can be yours at the low price of only $2,499!! Call us today at 888-772-3263 or 616-402-4120 for more information or to make a purchase. 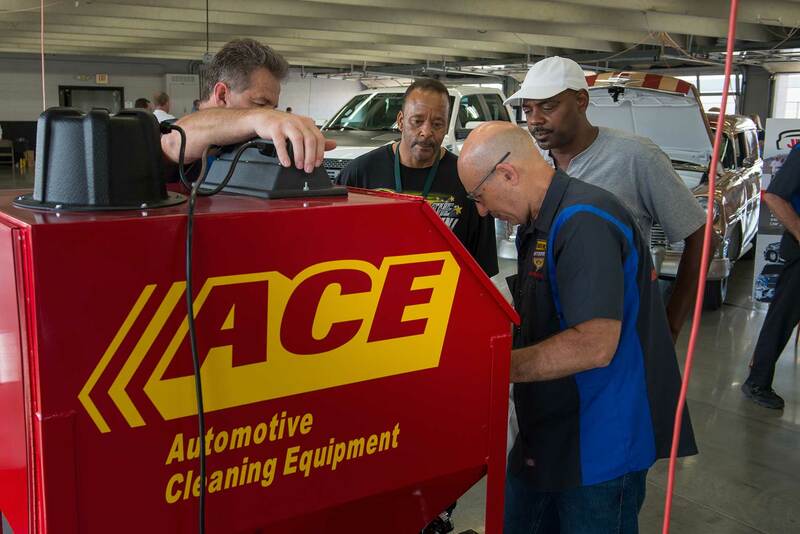 The Soda Blasting Guy demonstrating the ACE SODA PLUS in the Xfinity Series Garage at Charlotte Motor Speedway. This Soda Blast Cabinet is designed for use in manual cleaning to quickly blast away paint, grease, oils, carbon and other soils in an efficient manner. It is a fully contained working enclosure that protects the operator from dust and other contaminants. Perfect for cleaning aluminum cylinder heads! Large hinged top and side door allow easy loading and removal of items. The unit incorporates an ASME rated pressure vessel that contains the Soda Blast Media, and our new control valve system is designed to efficiently regulate the flow of compressed air and media to the nozzle. The dust collector exhaust fans, combined with the air intake on the blast cabinet, create a dual airflow through both the upper and lower enclosure to provide excellent visibility during the cleaning operation. In addition the dust collector’s primary and secondary filters capture spent media and soils, which are removed in the cleaning process and retain this waste in the dust collector hopper for easy removal. Please contact us if you have questions about this soda blasting equipment. ACE’s Performance Plus Dry Soda Blaster offers a low cost way for anyone to try this unique cleaning process. This lightweight, portable unit is limited only by the length of the air supply hose. Removal, cleaning and rapid repairs are easy, convenient and possible, virtually anywhere within a workshop or site. Great for small scale applications! •	Cylinder Capacity – 10 lbs. To read about the ACE Performance Plus in Woodworkers Journal, click here. To order Ace sandblast equipment by phone — call 888.772.3263.